Theologian & STROM.ec – Hubrizine CD. Out today, Friday June 13th! With their fifth full length CD, Finland's Strom.ec continue to further explore the far regions of power electronics, challenging the confines and stretching the boundary of the genre, sculpting new and innovative creations that are uniquely their own. Having been under construction for over seven years , Divine Legions shows Strom.ec with a majestic control of their craft, offering 8 tracks (including one 21 minute epic to close the CD out!) of powerful and explosive industrial music, full of volatile frequencies, brain bending, enigmatic atmospheres, hallucinatory noise, and the trademark vocal assault that few acts can rival. Presented in a luxurious 8-panel DVDigipak, designed by Jerome Nougaillon, Divine Legions Beyond Psyche represents Strom.ec at their finest, most creative form, having reached a pinnacle in an already illustrious discography. A track from forthcoming CD "Divine Legions Beyond Psyche" to be released by Malignant Records. 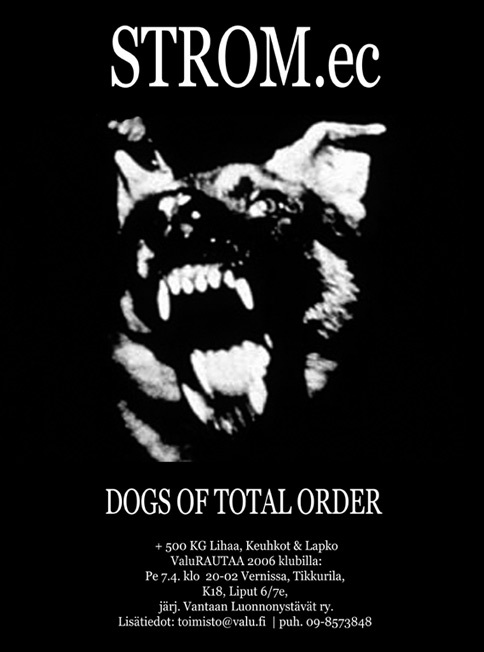 Our first album 'Dogs Of Total Order' has been remastered for vinyl LP release. Includes 16-page A4-sized booklet with all lyrics. Available Now! Under work is second chapter for our Arma Christi serie. This will be 'acoustic' power electronics material. To be released by Freak Animal as a 10" vinyl. More information later.